While population genetics typically focuses on migration and settlement patterns of relatively large groups of people, sometimes a genetic signature of just one person tells an interesting story as well. One perfect example comes from the recent research by Gérard Lucotte of the Institute of Molecular Anthropology in Paris. Two of his studies examined DNA extracted from some of the hair samples conserved in the Vivant-Denon reliquary, deposited in the Bertrand Museum of Châteauroux. The hair is authenticated as belonging to the French Emperor Napoléon I by Napoléon’s own signature on a letter, also kept in the reliquary and addressed to Vivant-Denon, whom Napoléon appointed the first director of the Louvre Museum. The study published in Investigative Genetics two years ago focused on the mtDNA, passed along the maternal line, while the study published in 2012 in Journal of Molecular Biology Research examined Y-DNA, passed along the paternal line. According to Lucotte’s most recent work, Napoléon I belongs to the Y-haplogroup E1b1b1c1*, as determined by the study of 10 NRY-SNPs (non-recombinant Y-single nucleotide polymorphisms). As expected, Charles Napoléon, a current collateral male descendant of Napoléon I (see chart on the left), belongs to this same Y‑haplogroup (as determined by a set of 37 non-recombinant Y-microsatellites). Ironically for a French Emperor and proud Corsican, Napoléon I carried paternal DNA that is most typical of the so-called Moors. The haplogroup E1b1b1c1—defined by mutation M34—was found at its highest concentration in Ethiopia and in the Near East, especially among Jordanians (31%), Ethiopian Amhara (24%), Ethiopian Jews (14%), Ethiopian Wolayta, and Ethiopian Oromo (8%). Other groups with high frequency of this haplogroup live in North Africa (Algerian Kabyles 11%), the northern Fertile Crescent (Southeastern Turkish 4%), and the Arabian Peninsula (Yemen 8%). 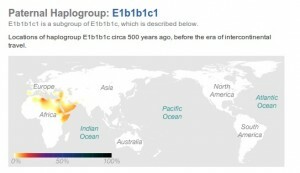 In Europe the haplogroup E1b1b1c1 is found predominantly in the south, especially in groups that have had significant gene flow from North Africa, such as Sicilians (7%), Sardinians (4%), and Southern Mainland Italians (2%). Corsicans, predictably, have a lower frequency of E1b1b1c1, only 1.4%. 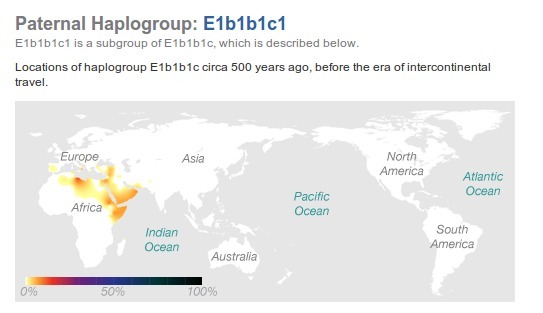 So while the fact that Napoléon I belongs to the haplogroup E1b1b1c1 is not surprising per se, there is more to this story. 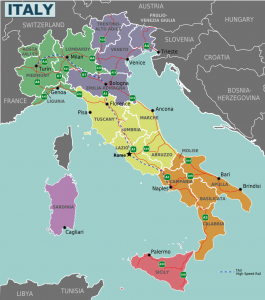 Napoléon I’s family on both sides hails from different parts of Italy: the mother of the Emperor, Laetizia Ramolino, was from Liguria in northwestern Italy, and the masculine line of the Buonaparte family was from Tuscany (central Italy). 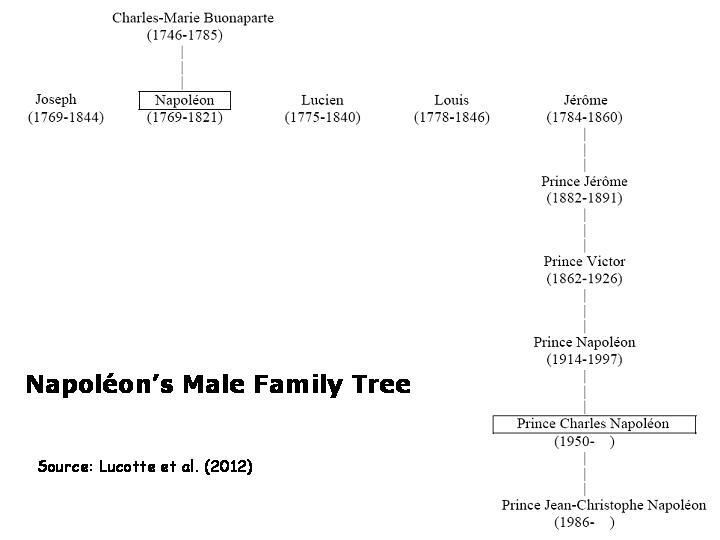 Napoléon’s paternal ancestors have been known since the 17th generation. The most remote known male ancestor of Napoléon is Gianfardo, who lived between the end of the 12th and the beginning of the 13th century. He was born and resided in Sarzana, a small town on the banks of La Magra river that separates Liguria and Tuscany. Owing its position, Sarzana changed masters many times, belonging first to Pisa, then to Florence, and ultimately to Genoa. 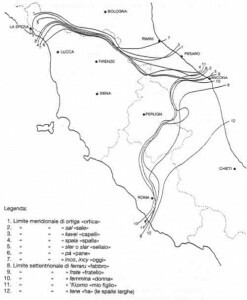 Linguistically, Sarzana is located right at the so-called La Spezia–Rimini Line, a line that demarcates a number of important isoglosses that distinguish Romance languages south and east, including the southern Italian dialects, from Romance languages north and west of it, including the northern Italian dialects. 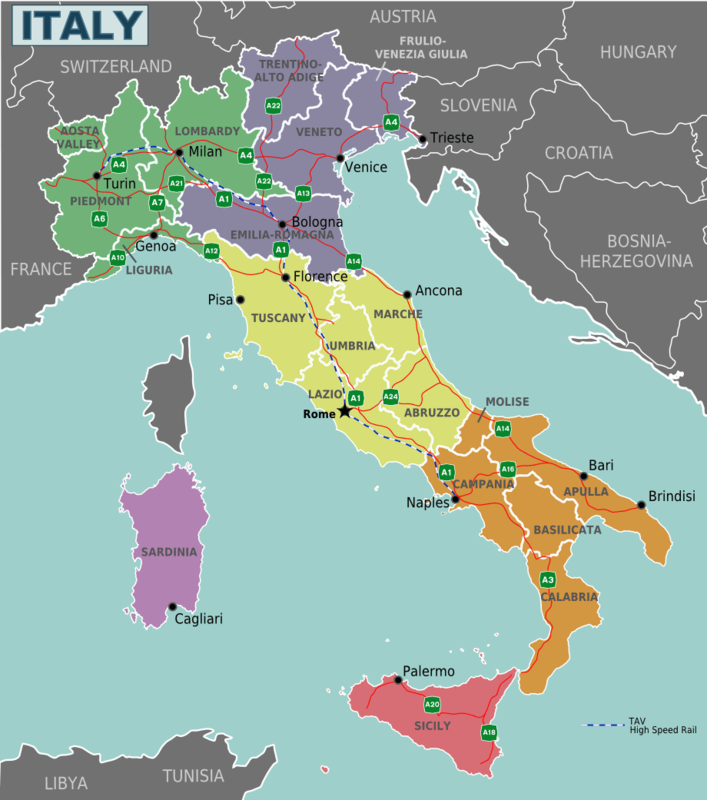 The linguistic developments that distinguish the two sets of Romance varieties probably originated in the late decades of the Western Roman Empire and under the subsequent Ostrogothic Kingdom in the 5th century CE, when the area of Italy north of the line was increasingly dominated by Germanic influences, while the Roman senatorial class and the Roman Catholic Church maintained dominance to the south of the line. One such linguistic difference concerns the way noun plurals are formed: north and west of the line, noun plurals were drawn from the Latin accusative case and is marked with -s (as with the French loup, loups ‘wolf, wolves’), whereas south and east of the line, noun plurals were usually taken from the Latin nominative case and are marked with vowels (as with the Standard Italian lupo, lupi ‘wolf, wolves’). The paternal ancestor of Napoléon who left Sarzana for Corsica was Giovanni Buonaparte, placed in the 11th generation back from Napoléon. Between Giovanni and Napoleone di Buonaparte, ten generations of paternal ancestors ensued in Corsica: Francesco, Gabriele, Girolamo, another Francesco, Sébastiano, Carlo, Giuseppe, another Sébastiano, another Giuseppe, and finally Carlo Maria Buonaparte, the father of Napoléon, who was born in 1746 and married to Laetizia Ramolino in 1764. Napoléon I himself knew his ancestry: he once declared that “the mother of Pope Nicolas V originated from Sarzane; she was also a Buonaparte”. On another occasion, he confidentially told Dr Francesco Antommarchi, his latest physician, about this male ancestry: “My most remote ancestor, who inhabited Toscane, had the principles that I profess”. 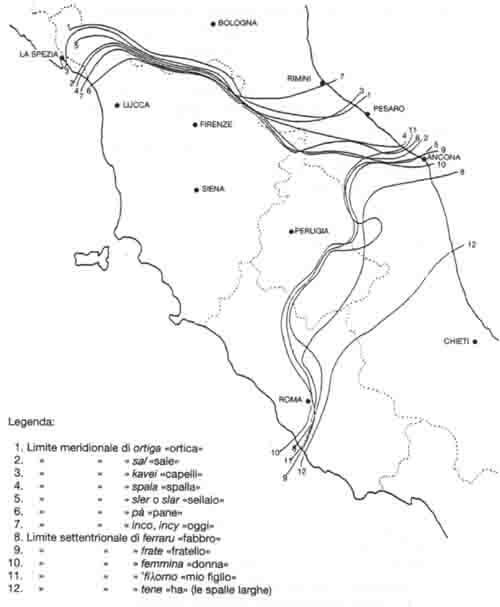 Napoléon also probably knew his remote eastern patrilineal origins, because Francesco (the son of Giovanni, the first Buonaparte to move to Corsica), who was a mercenary under the orders of the Genoa Republic in Ajaccio in 1490, was nicknamed “The Moor of Sarzana”. 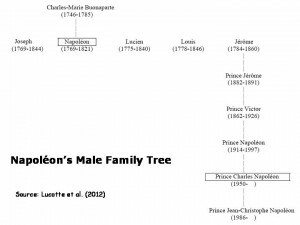 And what of Napoléon’s maternal (mitochondrial) DNA? Because each human cell contains several hundred mtDNA molecules, it is easier to analyze mitochondrial DNA as opposed to autosomal DNA or Y-DNA, simply because mitochondrial DNA is more abundant. Gérard Lucotte’s 2010 study examined the mitochondrial DNA extracted from the same hairs conserved in the Vivant-Denon reliquary and found a rare mutation that changes the base C to T at position 16,184. 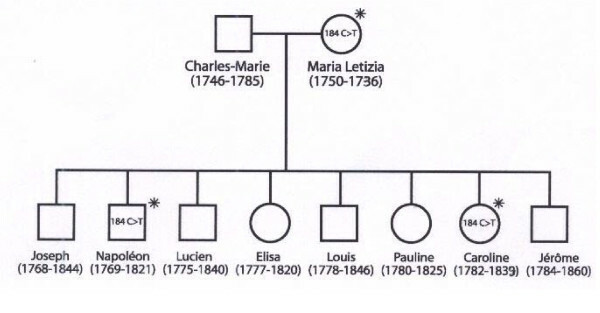 The same mutation was also found in the mtDNA extracted from hair samples belonging to Napoléon’s mother Letizia and his youngest sister Caroline, confirming that this mutation is maternally inherited. Letizia’s hair was preserved in a silver box deposited in the reserve of the Bertrand Museum and authenticated by a certificate written by the two physicians who had taken part in the mummification of Letizia’s body. Caroline’s hair came from a private collection and was authenticated by the current proprietor. Because of its rarity, this mutation constitutes a perfect tool for the authentication of other body samples—hair, bone, skin, etc.—purported to be those of Napoléon I, which are found in various museums and private collections around the world. Among those relics are a multiple locks of hair, too many to be possible, claimed to be those of Napoléon, especially those supposedly collected during his exile in St. Helena and after his death. 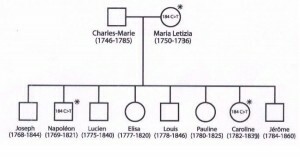 A simplified DNA method based on Lucotte’s results could be used as a genetic test to establish whether these locks really are those of Napoléon. In addition, another controversy is currently raging about the remains present in the crypt of Les Invalides in Paris. Is the body contained in the porphyry sarcophagus that of the Emperor, or is it possibly that of another man? If the latter, might it be the body of one of the Emperor’s servants? Exhumation of the corpse contained in the sarcophagus, or examination of a portion of frontal skin of the Emperor contained in a medallion, should provide answers to these questions. More generally, comprehensive DNA testing has been of considerable interest for identification of old forensic or historical samples. Another famous case involves remains of nine skeletons found in a shallow grave in Ekaterinburg, Russia, in July 1991. Forensic investigation suggested that the remains are those of the members of the imperial Romanov family, specifically Tsar Nicholas II, his wife Alexandra, and three of their five children, together with three servants and a royal physician, all murdered by the Bolsheviks during the Russian Civil War in 1918. A genetic study, conducted by Peter Gill and his colleagues and published in 1994 in Nature Genetics, compared mtDNA extracted from these remains with samples from living maternal relatives of Tsar and Tsarina; it confirmed that the remains are those of the Romanov family. One of the people whose DNA served as a comparison sample is Prince Philip, the Duke of Edinburgh, who is a member of the Danish-German House of Schleswig-Holstein-Sonderburg-Glücksburg and a great-great-grandson of Queen Victoria. Tsarina Alexandra was a granddaughter of Queen Victoria. 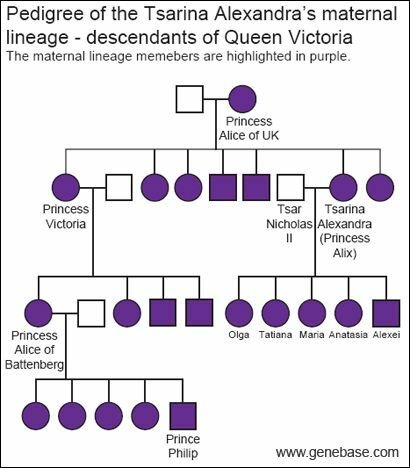 Both royals trace their maternal lineages to Princess Alice, who was the mother of Tsarina Alexandra and the great-grandmother of Prince Philip (see chart). After genetic studies confirmed their identity, the bodies of the Romanovs were reburied in a St. Petersburg cathedral. However, in 2007 the story broke out again, with the discovery of remains of a 10-13 year old boy and an 18-23 year old woman, presumed to be Tsar and Tsarina’s two missing children: Prince Alexei and Grand Duchess Maria (or possibly, the younger Grand Duchess Anastasia). While archeologists believed that the bodies, found not far from the burial site of the rest of the Romanovs, are those of the two royal children, the Russian Orthodox Church and the surviving descendants of the Romanov family have cast doubts on those findings. A genetic analysis of bone fragments from a newly discovered grave confirmed the remains to be those of Alexei and one of his sisters, thus ending the romantic speculation that two children survived the execution and fled the country to start a new life. For a long time, it was widely believed that the youngest daughter of Tsar Nicholas, Anastasia, escaped the execution; several women have falsely claimed to have been Anastasia, the most notorious of whom was Anna Anderson. Anderson’s body was cremated upon her death in 1984, but DNA testing in 1994 on available pieces of her tissue and hair showed no relation to the DNA of the Imperial family.